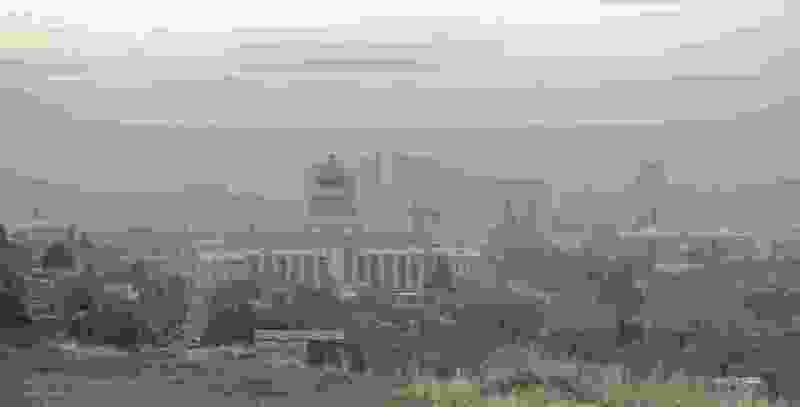 Al Hartmann | The Salt Lake Tribune Hazy scene of downtown Salt Lake City at 9:30 a.m. Friday Dec. 4 a few blocks north of the the Utah State Capitol. Air quality was in the yellow range. A recent poll showed that Utahns hate dirty air, but their willingness to make lifestyle changes to achieve clean air is limited. So, if Utah is stuck with toxic foul-smelling air, it is our fault, right? Wrong. Aside from the pollution-shaming, there are two major problems here: 1) Voluntary individual initiative alone will not cut it when it comes to cleaning up our air. 2) Willingness to change habits and behavior are inexorably tied to public policy, and that only comes from lawmakers. As the Founder of Utah Moms for Clean Air, I have been fighting to clean-up Utah’s infamously dirty air for over a decade and I can now say unequivocally that without governmental carrots and sticks we will never have clean air. Never. Why? Most people will take the path of least resistance. If it is much easier, faster and cheaper to drive for example, people will drive. But it is poor public policy, not poor individual decision-making, that makes mass transit a difficult and unrealistic option for most of us. There are always those clean air superheroes out there motivated by what is right and not what is easy, but there are not enough of them to offset everyone else. That is why public policy, i.e. strong government carrots and sticks, are absolutely essential to cleaning up our air. How many people would needlessly idle their cars if they really had to worry about a $200 fine for doing so? Not many. Change would happen overnight. Sticks work. How many truck drivers would dismantle their pollution controls if the fine was forfeiting their truck? Not many, if any. How many people would make their next car a nearly zero-emissions hybrid or electric car if they received a $10,000 rebate or tax credit? Many people would. Carrots work too. But this conveniently skirts around the question of why should the onus to reduce emissions be primarily on individuals? What voluntary initiatives and sacrifices are being implemented by our valley's biggest polluters? Not many. Carrots and sticks are absolutely essential when it comes to industrial polluters. Nearly 100% of the gains made on cleaning-up industrial emissions happened not voluntarily but because of the powerful Clean Air Act enacted by a Republican President in the 1970’s. Again, carrots and sticks work. Individuals need them and so does industry. Utah has been out of compliance with Federal Air standards for years, yet so many big plans with huge pollution footprints such as the expansion of Geneva Rock’s mining efforts and the Inland Port are on the drawing board. How can we invite more pollution into our valley when many of our citizens are already choking to death on our toxic air? Individuals are being asked to make sacrifices in time and money so that big polluters (and political donors) like Rio Tinto, Tesoro and Geneva Rock can continue pumping tons of toxic pollutants into our air while raking in record profits at our expense? How is that even remotely fair? And our leaders wonder why more people are not carpooling, taking mass transit and shoveling their snow. We instinctively know that we are being asked to make all the sacrifices while big polluters keep on making more and more pollution thus filling the void created by the goodwill of so many citizens. Yes, Utahns should carpool, telecommute, take public transportation, stop burning wood, and buy electric snow blowers if they want clean air. But Governor Herbert and Utah legislators must enact strong public policy that rewards those that make clean air choices and penalize those that make dirty air choices - including big corporations operating for-profit in our valley. Without carrots and sticks, Utahns will continue to choke on dirty air. So, Utah Legislature and Governor Herbert, please stop blowing hot air about how much you care about clean air and do the hard work that is required to get us there. Cherise Udell is the founder of Utah Moms for Clean Air and the recipient of the Utah Excellence in Ethics Award.